Marked by widespread political and social change, twentieth-century Russia endured violent military conflicts, both domestic and international in scope, and as many iterations of government. The world’s first communist society, founded by Vladimir Lenin under the Bolshevik Party in 1917, Russia extended its influence through eastern Europe to become a global power. The USSR and its controversial leaders polarized diplomacy worldwide, drawing the rival United States near to nuclear war in the 1960s. The events included in our timeline, sourced from Russia in World History by Barbara Alpern Engel and Janet Martin, highlight the most pivotal episodes in twentieth-century Russian history, each of which contributed to the Soviet Union’s eventual collapse in 1991. Featured image: Plainclothes policemen on patrol in Petrograd during the October Revolution, 1917. Public domain via Wikimedia Commons. Timeline background image: Flag of the Soviet Union. Public domain via Wikimedia Commons. Barbara Alpern Engel is Distinguished Professor of History at the University of Colorado, Boulder. She is the author of Mothers and Daughters: Women of the Intelligentsia in Nineteenth Century Russia, Between the Fields and the City: Women, Work and Family in Russia, Women in Russia: 1700-2000, and Breaking the Ties that Bound: The Politics of Marital Strife in Late Imperial Russia. Janet Martin is Professor Emerita of History at the University of Miami. She is the author of Treasure of the Land of Darkness: The Fur Trade and its Significance for Medieval Russia and Medieval Russia, 980-1584. Both are the authors of Russia in World History. If you interested in Russian timeline, that will interest you. 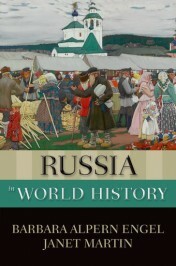 Many history series about Russia starting from its foundation – war events, rulers, crafts, trade and so on. Each movie is animated and shows the major events of the current period of time. New series are added every two weeks. Total 500 series. The period of XI – XVIII centuries is covered. Based on the Karamzin’s version (authoritive russian historian – check wikipedia for additional information).